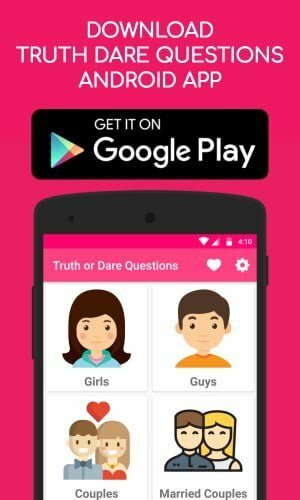 Let’s check our collection of best truth or dare questions one side lovers. You can try these questions when you are playing truth or dare game with your friends or with your crush. Enjoy our truth or dare questions for one side lovers and have a good laugh. Don’t you really love me? If your best friend suddenly proposes you, how will you react? Which one do you prefer? Arrange or love marriage? What’s your opinion on Love? Are you really busy with your works when I asked you to talk with me? What type of qualities did you require for accepting someone’s love? How many friends do you have before I met you? Do you face any problems when you’re with me? How do you feel when you see sad scenes in movies? What’s your parent’s opinion on love? Which type of love proposal do you like the most? When do you start falling in love with your best friend? Which type of love do you like more, a wild passionate love, or a quiet calm love? Hope you like our list of best truth questions for one side lovers. If you know any other truth questions for one side lovers. Let us know in the comment section below. Explain how do you feel when somebody falls in love with you. Make a call to the person who loves you secretly and do conversation with him/her without telling your name. Maintain a close relationship with someone in front of the person who loves you secretly. Say I hate You to your crush. Send a WhatsApp message to the person who loves you. Hug your best friend and ask him/her for dinner in front of your crush. Write a love message along with your crush name in your Facebook timeline and post it. Reveal your crush name in front of your friends. Explain your scariest dream you have ever had with your lover? Do any stupid thing to express your love in front of your crush? Ignore your girlfriend/boyfriend for one week. Give a missed call to your girlfriend/boyfriend. Express your love through a romantic song. Present a surprise gift to your girlfriend/boyfriend without mentioning your name. Hope you like our list of truth or dare questions for one side lovers. If you know any other truth or dare questions for one side lovers, let us know in the comment section below.